Additional Facts: The bald eagle, one of the largest and most magnificent of all North American birds, is our national symbol. Once endangered, it is now becoming more common. People have helped eagle populations by reducing the use of dangerous pesticides, by preserving eagle habitat, and by protecting eagles from being shot. 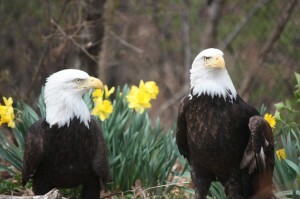 Nearly half of Illinois counties have a nesting pair of eagles with a reported 263 active nesting sites. Many more eagles migrate to our state each winter, arriving from the northern states and Canada. They congregate along the Illinois and Mississippi Rivers, catching fish. A few eagles even spend the winter hunting and fishing around Lake Decatur. 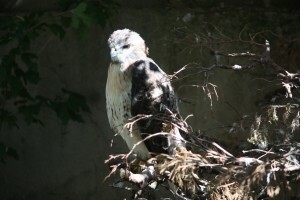 Red-tailed Hawks (Buteo jamaicensis) have made quite a comeback the past few decades. You can see them along highways flying, sitting in trees or on signs. For the Hawks courtship, the male will dive and shoot back up in steep angles. He will then fly over and briefly touch or grasp the female. After this the pair may grab onto each other or lock their talons and spiral towards the earth. How about that for extreme dating?